I really appreciate your taking time to review my site. I love to paint, and have been enthusiastic about painting landscapes and seascapes since I was a teenager. I started painting when my parents gave me a paint-by-number set. Before long I felt limited by having to stay within the lines, and asked them if I could have an old window shade that was collecting dust in the cellar. I still have the painting I did on a piece of that old shade! While my kids were growing up, I traveled with my family throughout New England looking for interesting venues. 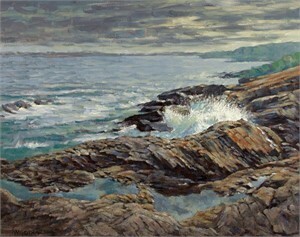 I particularly love Maine, New Hampshire, Cape Cod, and Nantucket, and several of my paintings depict scenes from there. In 2015, I traveled with my wife, Beth to Montana to see friends. As a result of the paintings I did there, I created a new section on the site called “Western Art”. Two of those paintings, “Black Mountain” and “Late Day at Monture Creek”, were selected by the Missoula Museum of Art for their 2017 and 2018 exhibit/auctions. “Clark Fork River” recently sold through Radius Gallery in Missoula. My favorite medium is oil paint, and I often take my paints with me when I travel to do color studies. The complete process includes pencil layout, on-site “blocking” in oil, reference photography, and finish work in my studio in Andover, MA. I minored in Fine Art at Holy Cross College in Worcester, Mass. and have studied landscape painting at the Museum of Fine Art in Boston and the Smith Art Museum in Springfield, MA. I have worked as an art director in Boston, and managed an international marketing company for 20 years. Painting is my new profession. William Gotha I really appreciate your taking time to review my site. I love to paint, and have been enthusiastic about painting landscapes and seascapes since I was a teenager. I started painting when my parents gave me a paint-by-number set. Before long I felt limited by having to stay within the lines, and asked them if I could have an old window shade that was collecting dust in the cellar. I still have the painting I did on a piece of that old shade! While my kids were growing up, I traveled with my family throughout New England looking for interesting venues. 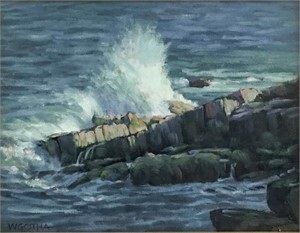 I particularly love Maine, New Hampshire, Cape Cod, and Nantucket, and several of my paintings depict scenes from there. In 2015, I traveled with my wife, Beth to Montana to see friends. As a result of the paintings I did there, I created a new section on the site called “Western Art”. Two of those paintings, “Black Mountain” and “Late Day at Monture Creek”, were selected by the Missoula Museum of Art for their 2017 and 2018 exhibit/auctions. “Clark Fork River” recently sold through Radius Gallery in Missoula. My favorite medium is oil paint, and I often take my paints with me when I travel to do color studies. The complete process includes pencil layout, on-site “blocking” in oil, reference photography, and finish work in my studio in Andover, MA. I minored in Fine Art at Holy Cross College in Worcester, Mass. and have studied landscape painting at the Museum of Fine Art in Boston and the Smith Art Museum in Springfield, MA. I have worked as an art director in Boston, and managed an international marketing company for 20 years. Painting is my new profession.